In Saving Simon – Book 5 of my Tarnished Saints Series, Simon takes Piper to the orchard to pick peaches. In return, she makes him a mouthwatering dessert. Piper, can you tell us how you did it? PIper: Sure Elizabeth. But first off, I need to tell everyone that Simon always calls me Pippa. Here is the recipe which is very easy to make. 4 fresh peaches – cut in half and discard pit. Cinnamon & ground Ginger – sprinkle a good amount on the cut side of the peaches. Place cut side down on medium heat of grill for about 5 minutes or until it gets grill marks. Turn over to the skin sides and let cook until soft. They will fill up with juice like little boats, so be careful not to waste all that good flavor by spilling it. 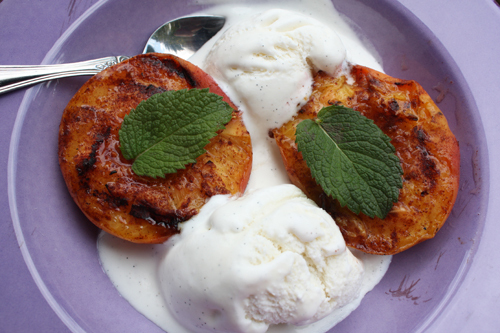 Serve over vanilla bean ice cream while still hot. Serves 4.